After months of possible manufacturing hurdles, the Intel ultrabooks are finally beginning to make their public debut. 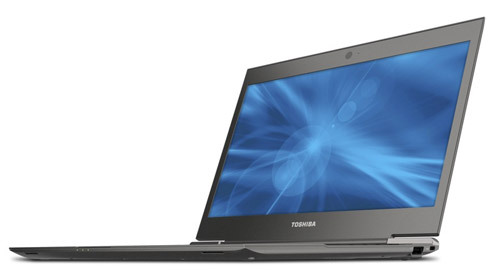 Toshiba at this year’s IFA has stepped into the ultrabook market with its unveiling of the Portege Z830 notebook. This 13.3-inch laptop will be extremely lightweight and thin at only 2.45 pounds (1.11kg) and 0.63 inches (16mm) thick. For comparison, the 13-inch MacBook Air weighs in at almost 3 pounds (1.36kg) with a thickness of 0.68 inches (17mm). The ultrathin form factor shouldn’t be sacrificing build quality either as the chassis will be made of aluminum and magnesium alloy. “The Portege Z830 sets a new standard for thin and light systems, not just in portability, but also in affordability for such cutting-edge designs,” said Toshiba in its press release. A backlit and spill-resistant keyboard are included as well. The specs of the notebook are equally impressive. The Z830 will include a Sandy Bridge Core ix CPU up to an i7 with up to 6GB of RAM. Exactly what processor models will be made available is still unknown. Fortunately, the Z830 should be coming with a healthy number of connectivity options including USB 3.0, 2x USB 2.0, WiDi, HDMI, VGA and Ethernet. 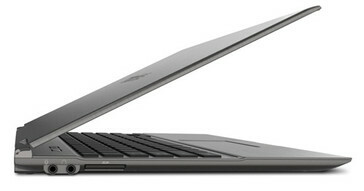 Expect this Toshiba ultrabook to hit shelves this coming November. Models will start below $1000, but we expect that the Z830 can easily blow past that price mark with higher-end upgrades. IRVINE, Calif., Sep 01, 2011 (BUSINESS WIRE) -- Toshiba's Digital Products Division (DPD), a division of Toshiba America Information Systems, Inc., today unveiled the Portege(R) Z830 Series, the company's first Ultrabook(TM) using 2nd Generation Intel(R) Core(TM) processors. Weighing less than 2.5 pounds(1) and featuring a 0.63-inch (15.9 mm) profile, the Portege Z830 Series is about 20 percent lighter and 40 percent thinner than the award-winning ultraportable Portege R830 Series. These new systems offer unprecedented portability, durability and essential features with visibly smart style and responsiveness -- and start at under $1,000 MSRP(2). Supporting the latest 2nd Generation Intel Core processors(3) and ultra-fast DDR3 memory, the Portege Z830 Series provides the performance needed for work and entertainment plus improved power management for great battery life. The Ultrabook device's 128GB solid state drive(4) delivers an extremely responsive experience, increased durability and increased energy efficiency. Paired with Toshiba's new exclusive Hi-Speed Start Technology, the Portege Z830 can power on and get users up and running at work or home in just seconds. "The Portege Z830 Series sets a new standard for thin and light systems, not just in portability, but also in affordability for such cutting-edge designs," said Carl Pinto, vice president of product development, Toshiba America Information Systems, Inc., Digital Products Division. "Toshiba's engineering achievements and expert craftsmanship have resulted in a brilliant and fully thought-through innovation that exceeds expectations, perfect for both mobile business professionals and consumers." The Portege Z830 Series is built with a host of convenience-driven features such as a full-size LED Backlit and spill-resistant keyboard that makes typing easy in low light conditions and helps guard against accidents. The Ultrabook also includes Toshiba's USB Sleep & Charge(5) technology to give users the freedom to power up their smartphones even while the system is powered down. Stereo speakers with enhanced audio technology from Waves Audio make the Portege Z830 ideal for listening to music, watching movies and video chatting. The Ultrabook devices feature a light, yet durable magnesium alloy casing that is reinforced with an enhanced Honeycomb Rib design and new internal structures that provide shock absorption and increased rigidity. The systems also feature Toshiba's EasyGuard(R) Technology, designed to address the security, reliability and durability issues mobile users encounter. 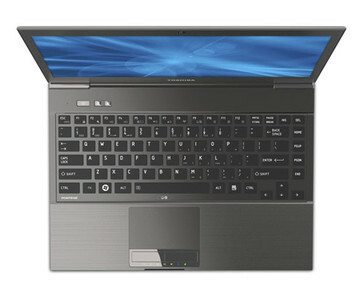 Portege Z830 Series Ultrabook systems will be available in November 2011 at select retail stores as well as through select Toshiba Preferred Partner Program resellers and directly at toshibadirect.com. Connect with Toshiba on Twitter at twitter.com/ToshibaUSA, on Facebook at www.facebook.com/ToshibaUS , and on YouTube at www.youtube.com/ToshibaUS . Toshiba Corporation is a world leader and innovator in pioneering high technology, a diversified manufacturer and marketer of advanced electronic and electrical products spanning digital consumer products; electronic devices and components; power systems, including nuclear energy; industrial and social infrastructure systems; and home appliances. Toshiba was founded in 1875, and today operates a global network of more than 490 companies, with 203,000 employees worldwide and annual sales surpassing 6.3 trillion yen (US$77 billion). Visit Toshiba's web site at www.toshiba.co.jp/index.htm . (C) 2011 Toshiba America Information Systems, Inc. All product, service and company names are trademarks, registered trademarks or service marks of their respective owners. Information including without limitation product prices, specifications, availability, content of services, and contact information is subject to change without notice. All rights reserved. Ultrabook is a trademark of Intel Corporation in the U.S. and/or other countries. (2) Price. Reseller prices may vary. MSRP means "Manufacturer's Suggested Retail Price." (5) The "USB Sleep & Charge function" may not work with certain external devices even if they are compliant with the USB specification. In those cases, turn the power of the computer ON to charge the device. SOURCE: Toshiba America Information Systems, Inc.